Good catching up with aspiring pro Allante Williams out here in Vegas. Remember seeing Allante training at the Mayweather Boxing Club last year, as he told me his story of trying to break through the pro ranks without any true backing. The hurricane of drama that followed the Mayweather vs. Pacquio fight was almost expected, as these things never end on a good note. 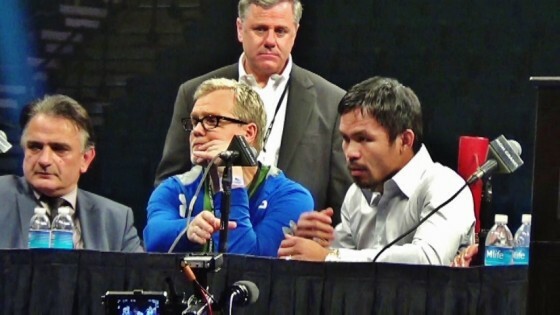 Aside from the numerous lawsuits, Pacquiao had exposed a serious injury at the post fight press conference, stating that he had to fight with an injured shoulder, limiting his abilities in the ring. At first it seemed like that was his only announcement following the bout, which in itself is a very powerful statement. 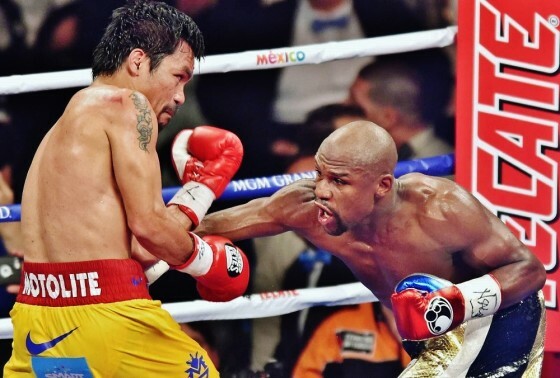 Mayweather vs. Pacquiao rematch in the works? 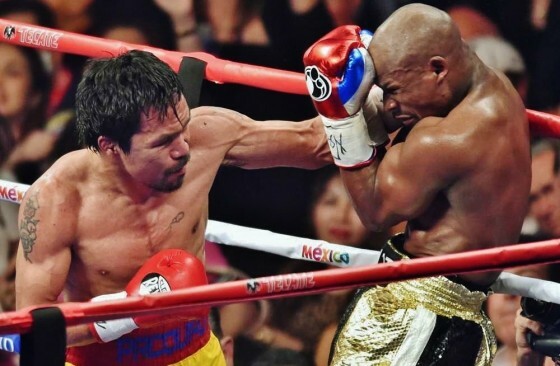 After spending ludicrous amounts of money on the first Mayweather vs. Pacquiao fight, and voicing mostly disappointment, would the fans be willing to do it all over again in hopes of the rematch being more entertaining? Boxing is one thing, but Floyd vs. Manny is another. There are great matches happening virtually every week, with most not even being noticed. Even those fights that get the attention of international media as well as the top ranked TV networks, they are soon forgotten. There has been no shortage of opinions or emotions that have come into play following Floyd Mayweather’s clear-cut unanimous decision victory over Manny Pacquiao on May in Las Vegas. Mayweather fought his typical match that Saturday evening, nullifying Pacquiao’s attack as he cruised to a points win over 12. There are surprises around every corner in boxing and last week I spotted a face I hadn’t seen for quite some time this past Thursday afternoon. Inside of the Roy Jones Jr. Fight Academy in Vegas, I saw Tommy Summers, aka Tommy Smalls, monitoring the progress of 16-year old boxing star Devin “The Dream” Haney as he rigorously went through the rounds. 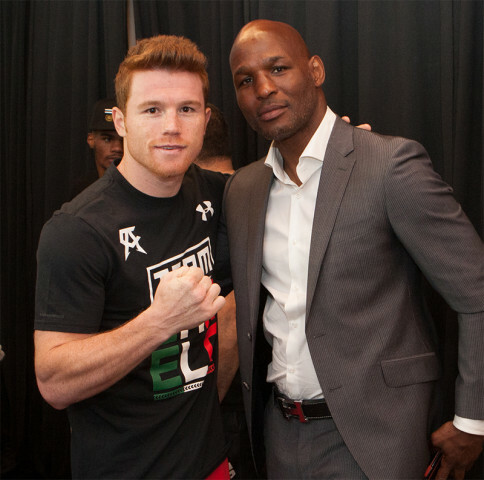 On Thursday afternoon, in Houston, Texas, the final press conference ahead of this weekend’s Saul “Canelo” Alvarez vs. James Kirkland showdown, set for Saturday night on HBO, took place. Our guy Sergio Venegas was on hand as the fighters, Golden Boy Promotions President Oscar De La Hoya, living legend and former two-division champion Bernard Hopkins, 50 Cent, and others addressed the media. While it is impossible and unnecessary to ignore the opinions of dedicated Mayweather and Pacquiao fans about the conclusion of their bout, the insightful view of someone with more in-depth boxing experience adds a lot to the substance of the outcome of their fight. 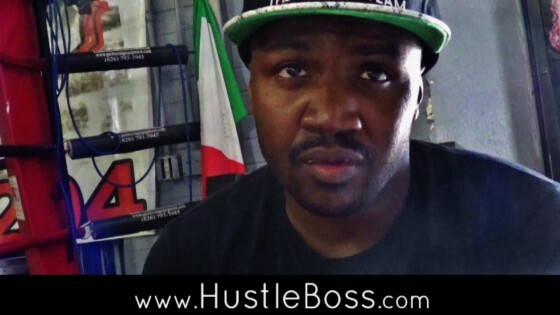 Kenny Porter comes with a respectable amount of knowledge and experience when it comes to the sport of boxing, and in his interview with Hustle Boss’ Chris Robinson he talks about the fight, and what camp Pacquiao should have done afterwards. 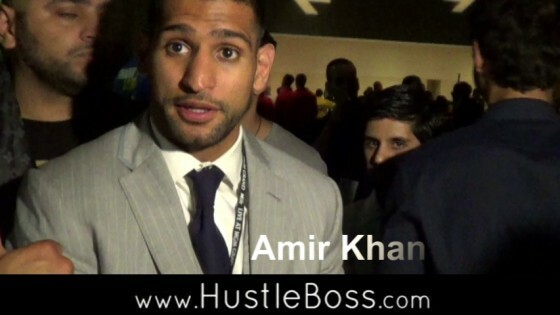 With the Floyd Mayweather vs. Manny Pacquiao showdown now behind us, several people are turning to the possibility of Mayweather facing off with British star Amir Khan in his next match. 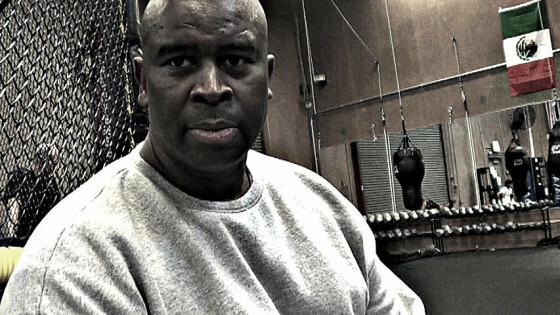 With the fanstasy matchup buzzing around the boxing circuit, I decided to get one of Mayweather’s top sparring partners in recent camps, Will “Simply Amazin’”, in an effort to get his thoughts. 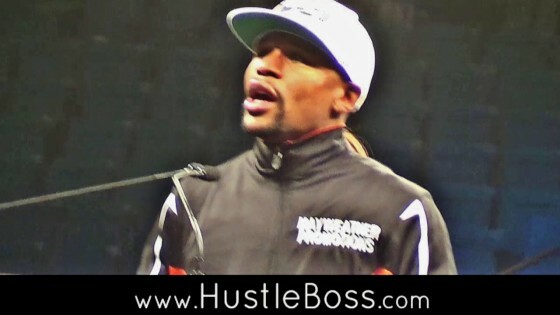 The fallout from the Floyd Mayweather vs. Manny Pacquiao event continues, as HustleBoss.com continues to get feedback on the match that the world waited 5 years for. Inside of the MGM Grand in Las Vegas, Nevada, Mayweather handed Pacquiao his sixth professional defeat by way of unanimous decision after 12 rounds by scores of 118-110 and 116-112 twice. The conclusion to the Mayweather vs. Pacquiao bout this past Saturday night was as clear as could be, with Floyd winning by a solid margin. The scores came out to be 118-110 and 116-112, and 116-112. The fight neither looked close, nor did it ever suggest the need for a rematch. 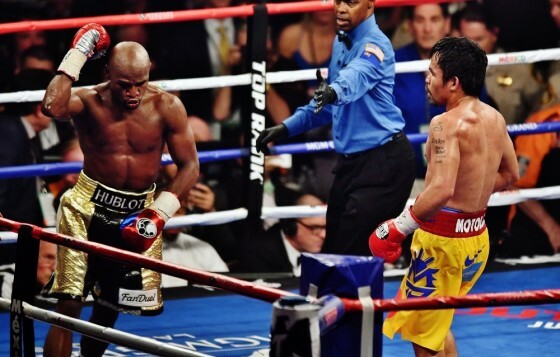 As a matter of fact, Mayweather himself stated that a second fight is not necessary. It would be difficult to disagree with this, especially after so many people have voiced their annoyance of the fight itself being so lackluster and monotone, as many of Mayweather’s fights tend to be. 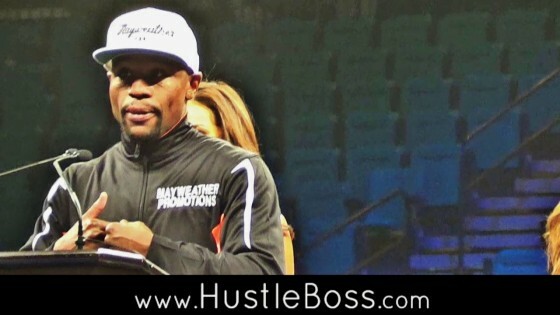 Floyd Mayweather has always had an on and off relationship with the media. Sometimes the Grand Rapids native will open up and share another side of himself, while other times he is quick to fire backlash towards those who have doubted his career. May 2 – Was It Worth The Wait? This question does not call for an involved debate or a complicated answer. Aside from becoming the most financially successful sporting event in sports history, Floyd Mayweather vs. Manny Pacquiao was also the most discussed one as well. #MayPac blew up Twitter, with the fight being mentioned over 5 million times during the actual bout, peaking at 150,000 Tweets a minute. Images from photographer Naoki Fukuda, who was inside of the MGM Grand Garden Arena on Saturday, May 2. In front of a sold-out crowd, Mayweather (48-0, 26 KO’s) controlled Pacquiao (56-6-2, 38 KO’s) over the course of 12 rounds in the biggest financial prizefight to date. 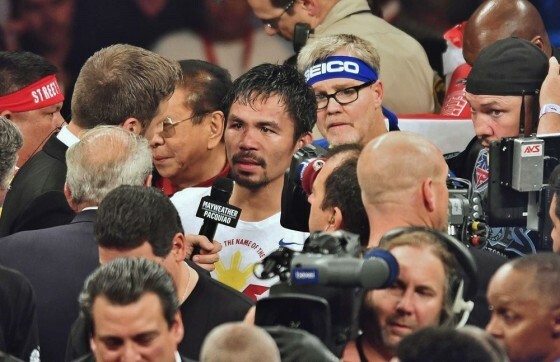 The night of Saturday, May 2 appeared to be a bit of a humbling one for Manny Pacquiao. 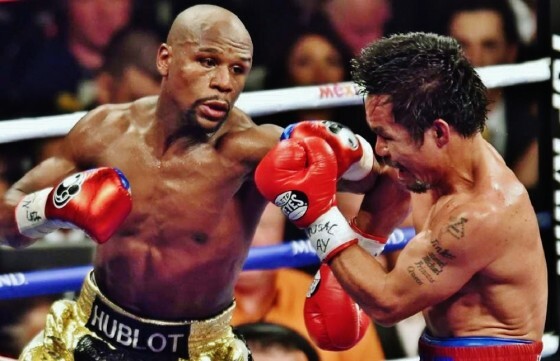 After 12 rounds of action, or lack thereof, the Filipino icon suffered the sixth loss of his professional career, dropping a unanimous decision loss to Floyd Mayweather by scores of 118-110 and 116-112 twice. 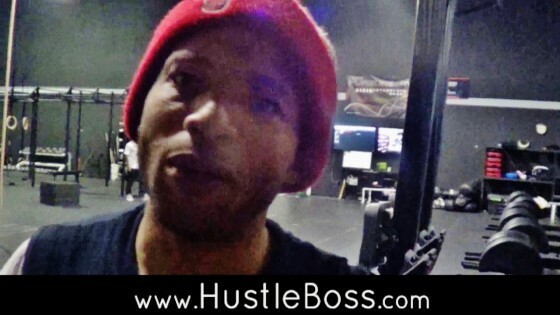 HustleBoss.com was on hand inside of the MGM Grand in Las Vegas, Nevada as Floyd Mayweather spoke to the media following his victory over Manny Pacquiao. 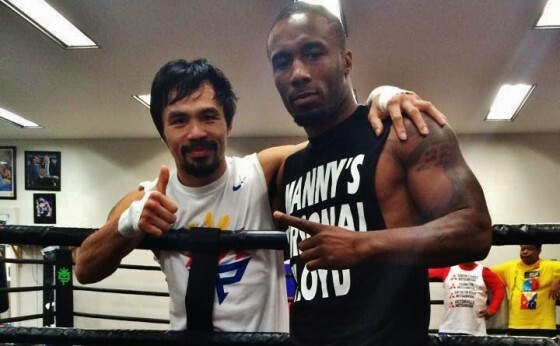 In this clip, Mayweather congratulates Pacquiao, trainer Freddie Roach, and other team members. 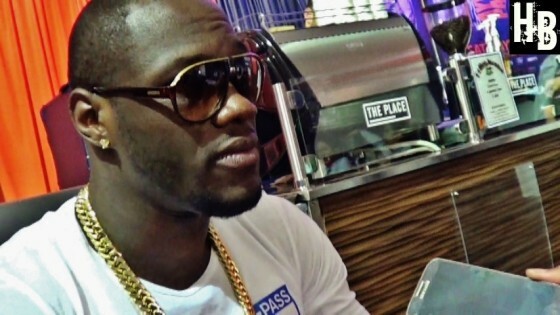 HustleBoss.com was on hand inside of the MGM Grand Garden Arena in Las Vegas, Nevada as Manny Pacquiao, Top Rank promoter Bob Arum, and Hall of Fame Trainer Freddie Roach spoke to the media about Manny’s right shoulder tear that affected him vs. Mayweather during his unanimous decision loss. Check out the clip to see how the injury affected Pacquiao’s performance and much more. 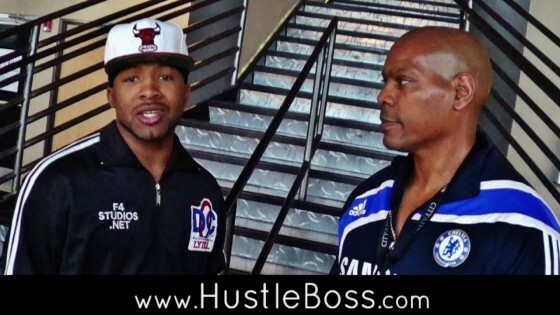 HustleBoss.com was on hand inside of the MGM Grand Garden Arena on Saturday, May 3 as eight-division world champion Manny Pacquiao (57-6-3, 38 KO’s) spoke to the media following his loss to Floyd Mayweater. 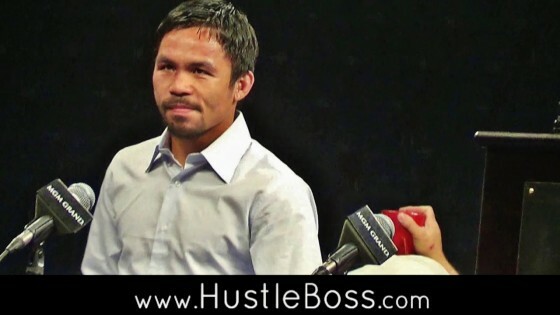 In this clip, Pacquiao speaks on his tough loss to Mayweather and shares his thoughts. On Saturday night, Floyd Mayweather (48-0, 26 KO’s) won a clear unanimous decision victory over Filipino icon Manny Pacquiao (57-6-2, 38 KO’s) inside of the MGM Grand in Las Vegas, Nevada over 12 rounds. 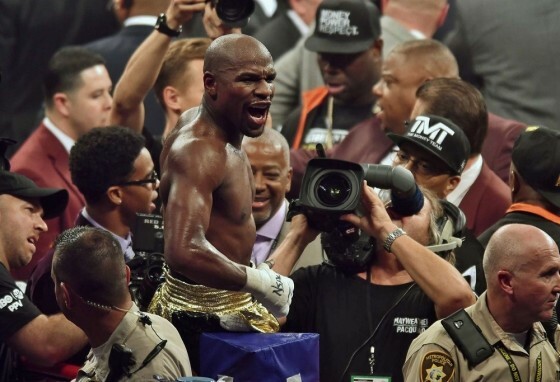 The win cement’s Mayweather’s place as the game’s premier fighter, as well as being the biggest cash cow in the sport. 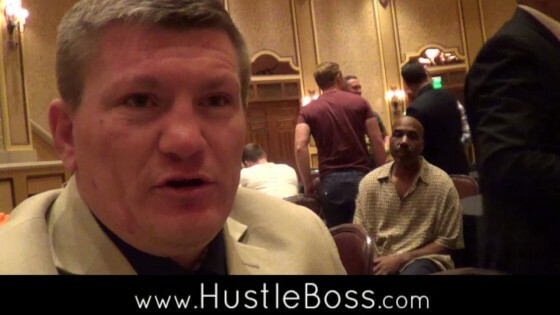 HustleBoss.com speaks with UK star, the beloved Ricky Hatton, prior to the Floyd Mayweather vs. Manny Pacquiao showdown in Las Vegas, Nevada. Hatton fought Mayweather and Pacquiao himself, losing to Floyd via a 10th round TKO in December of 2007 and falling to Pacquiao via a 2nd round knockout in May of 2009.